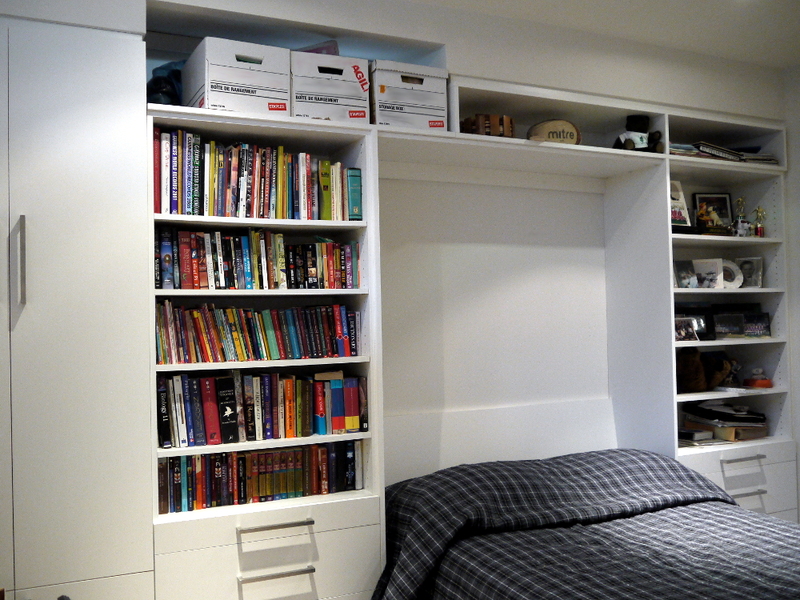 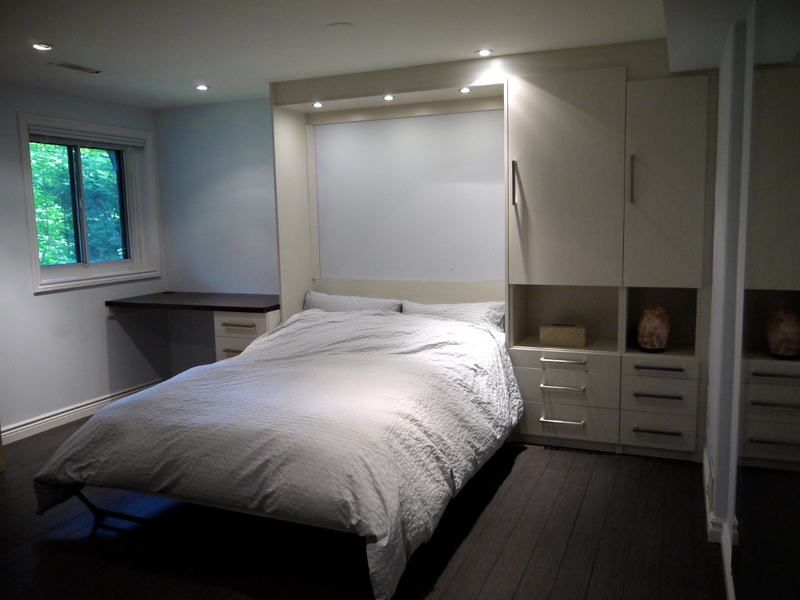 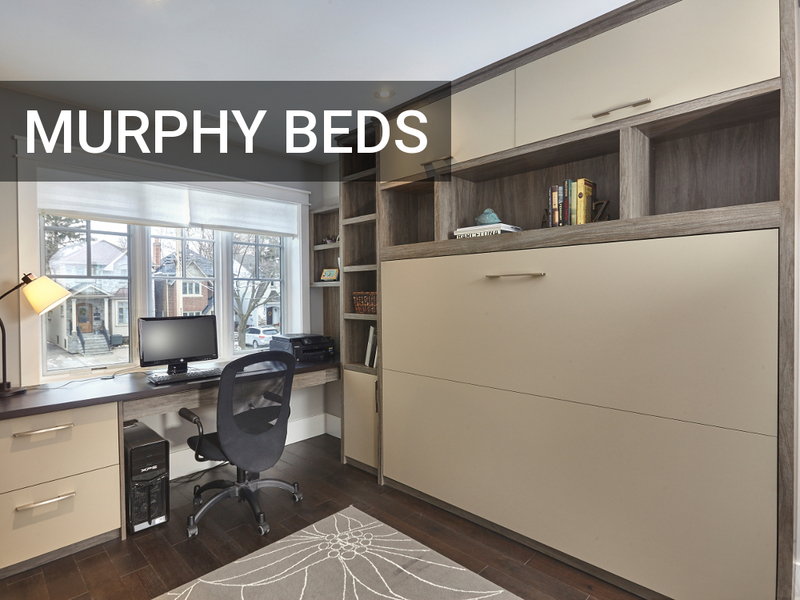 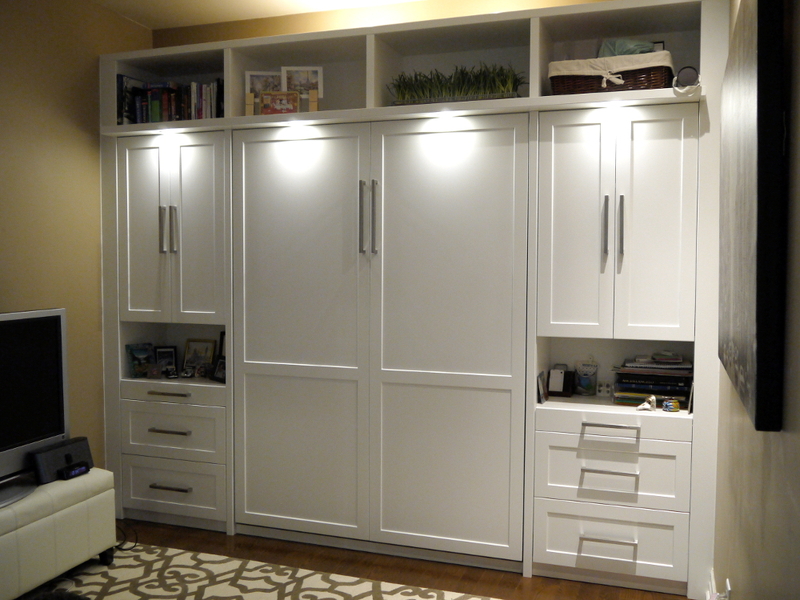 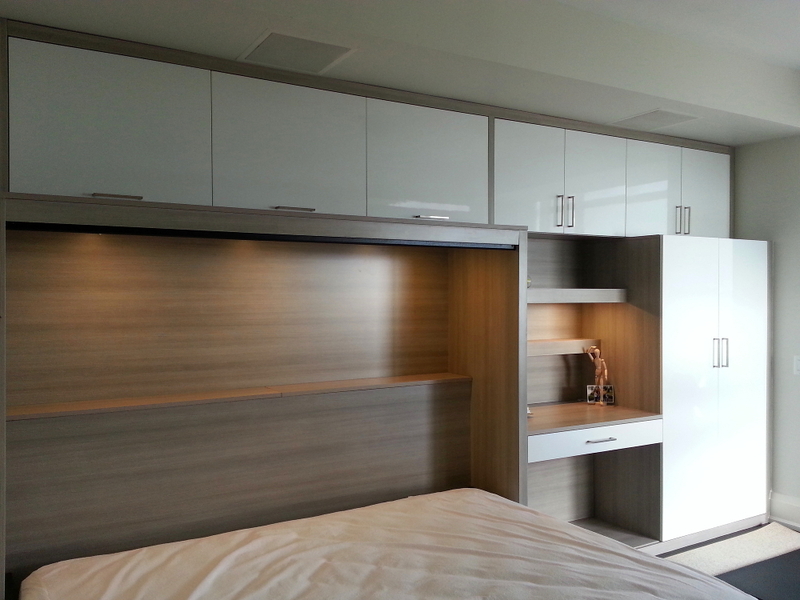 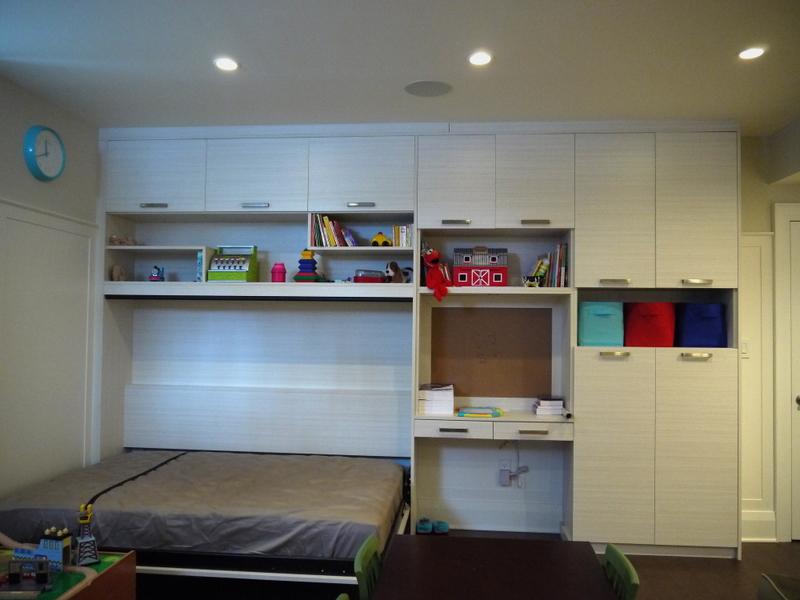 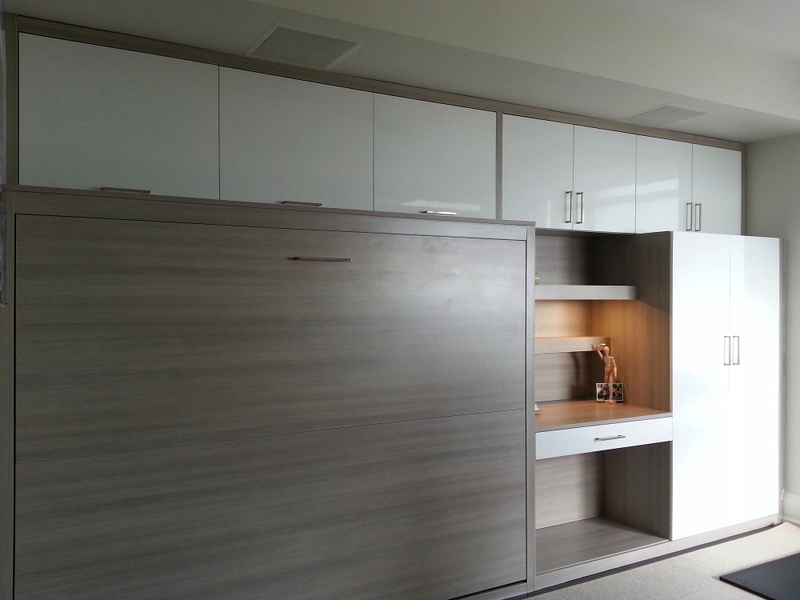 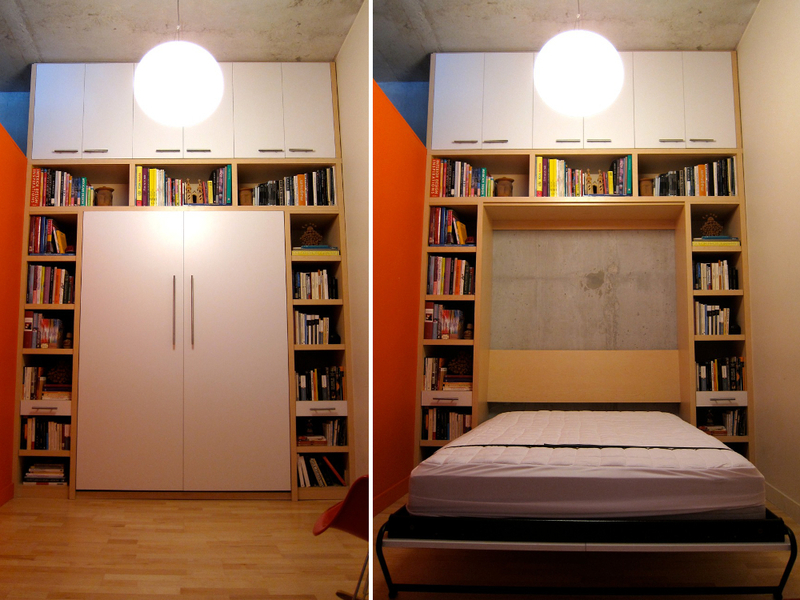 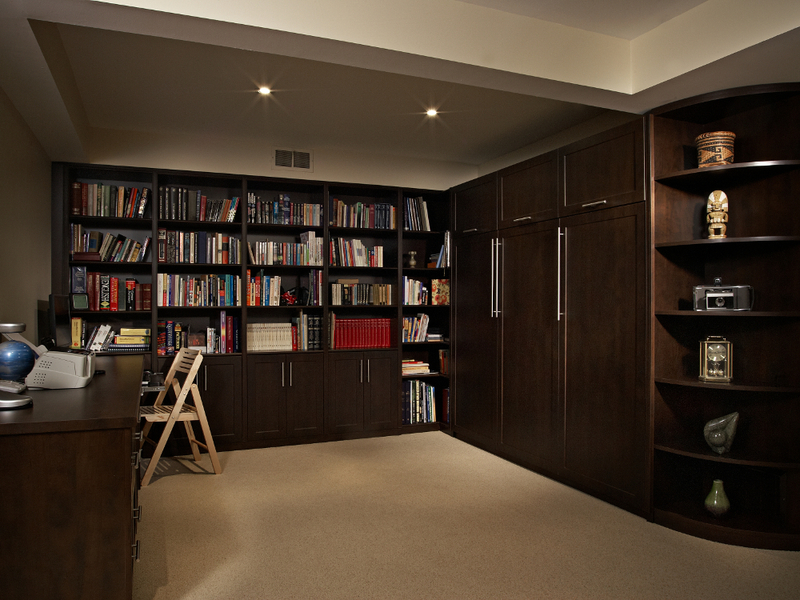 Toronto Murphy Beds, Wall Beds & Space Saving Solutions in the GTA. 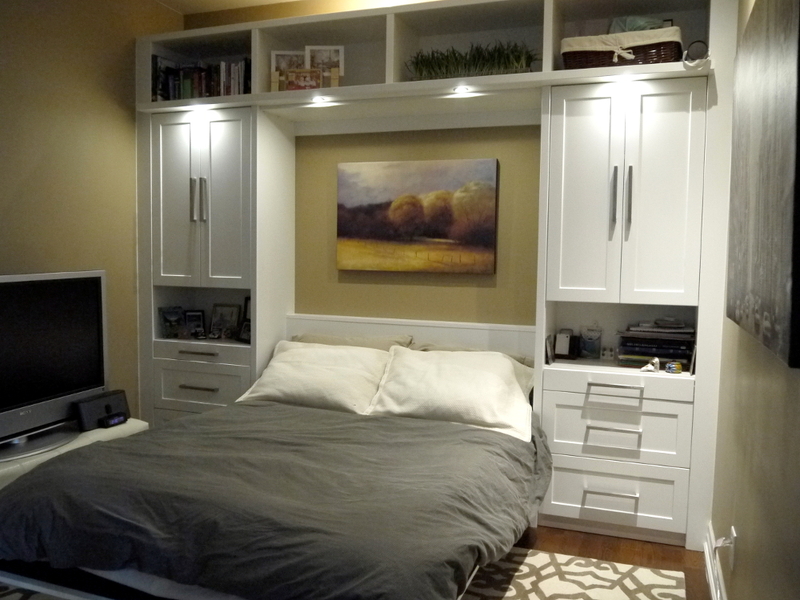 Side tilt double murphy bed in white and seems likatre melamine with LED lights. 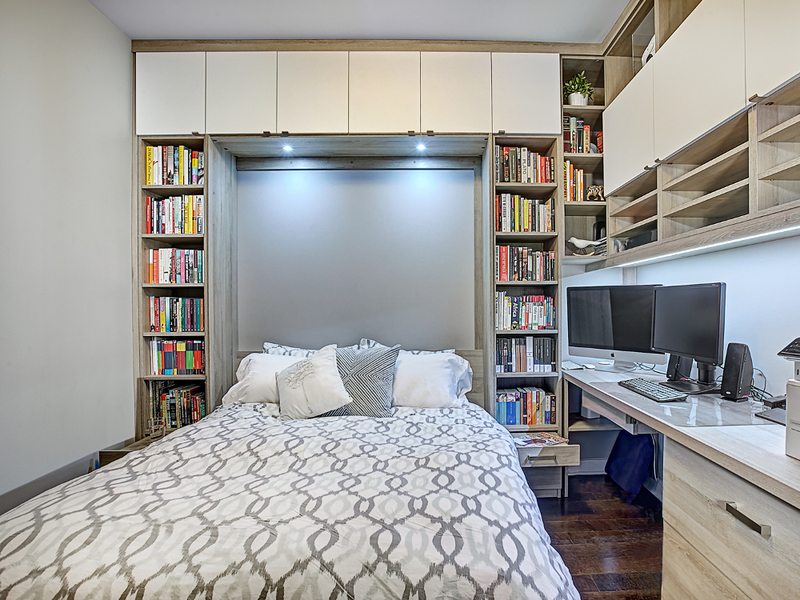 Murphy Beds, sometimes known as Wall Beds, are a great multi-functional solution for the dilemma of what to do with a room that also needs to be able to accommodate a bed. 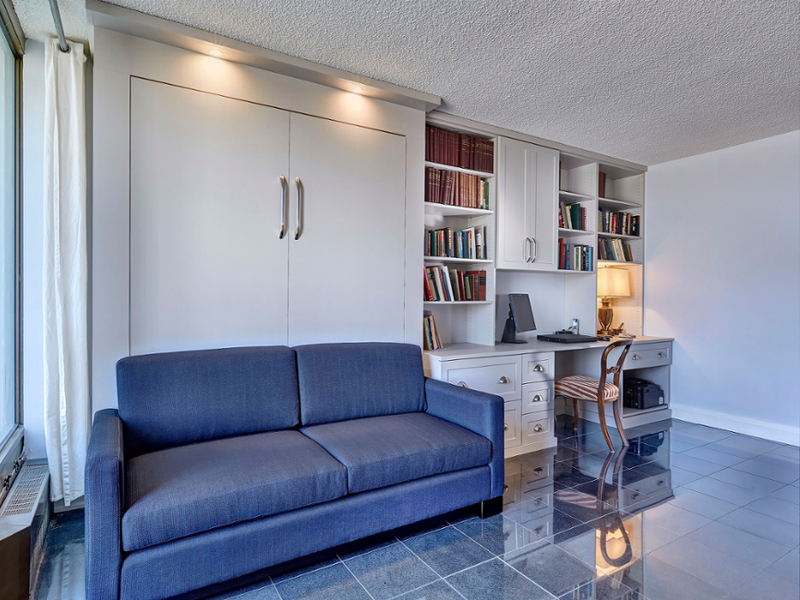 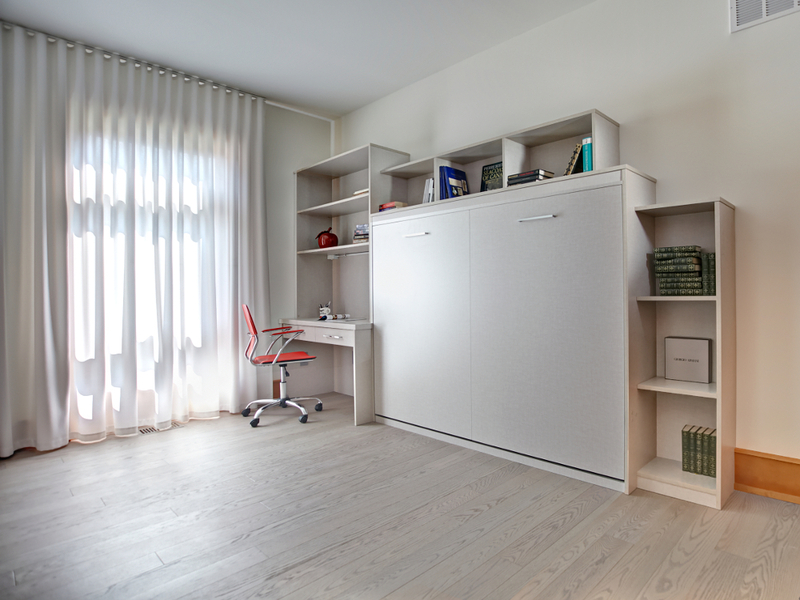 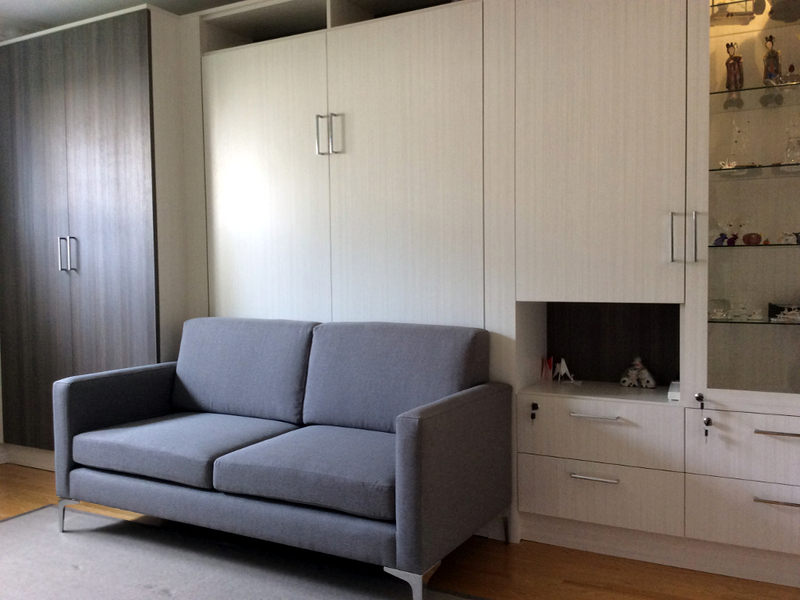 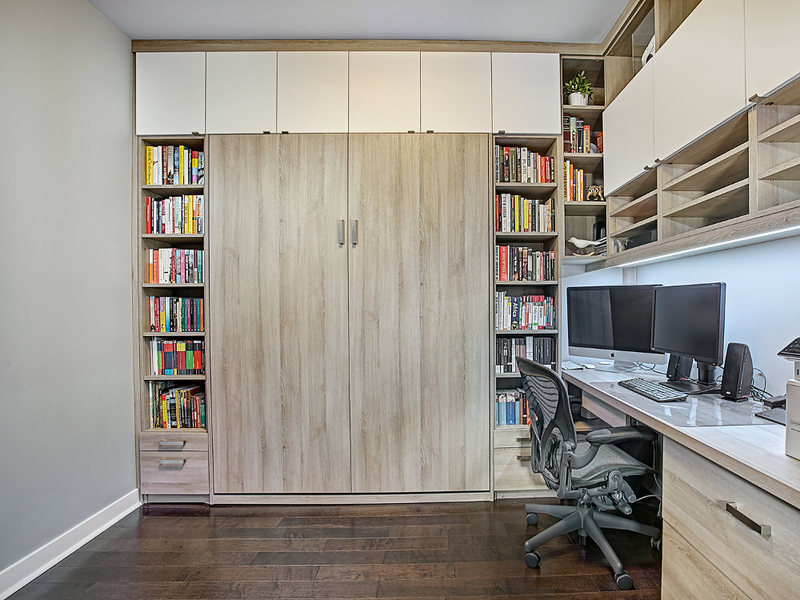 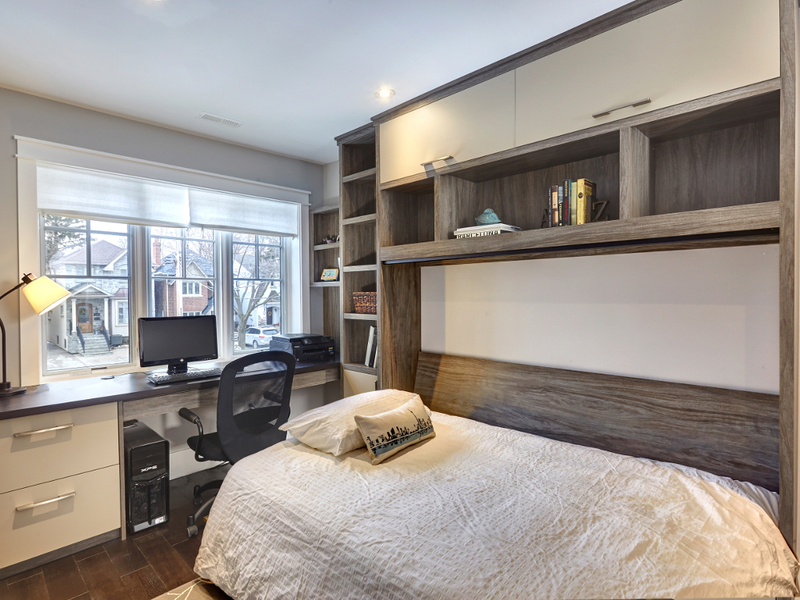 Whether you are working with a Home office, a Family Room, even an open-concept studio space without a defined bedroom, a custom Murphy Bed offers you the opportunity to have a real bed that may be folded away against the wall when not in use. 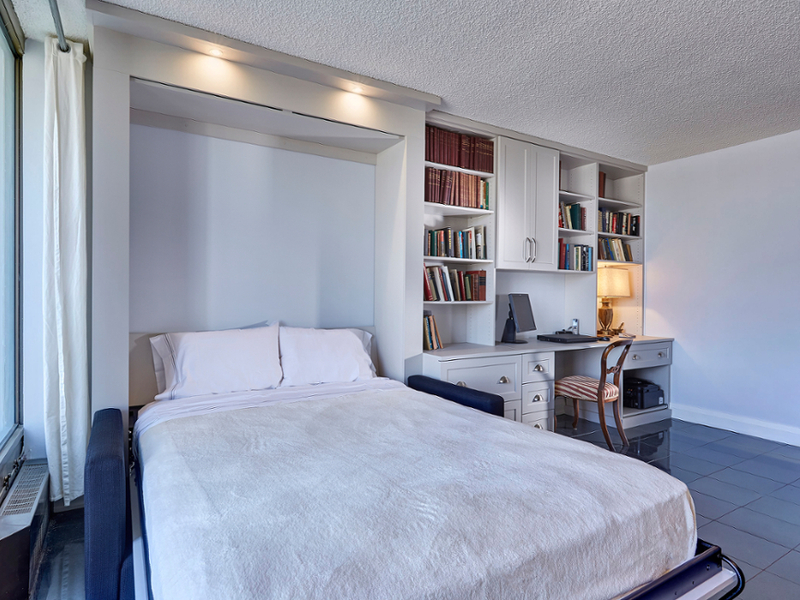 Most often, you supply your own mattress — any standard-size Single, Double or Queen, maximum thickness of 10″ — so your bed is as comfortable as you choose! 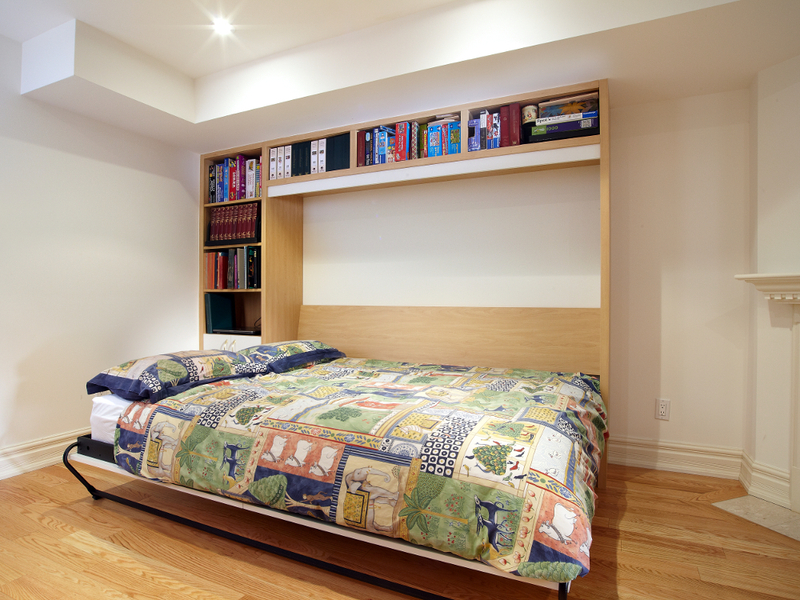 For 6 useful mattress tips, read this post! 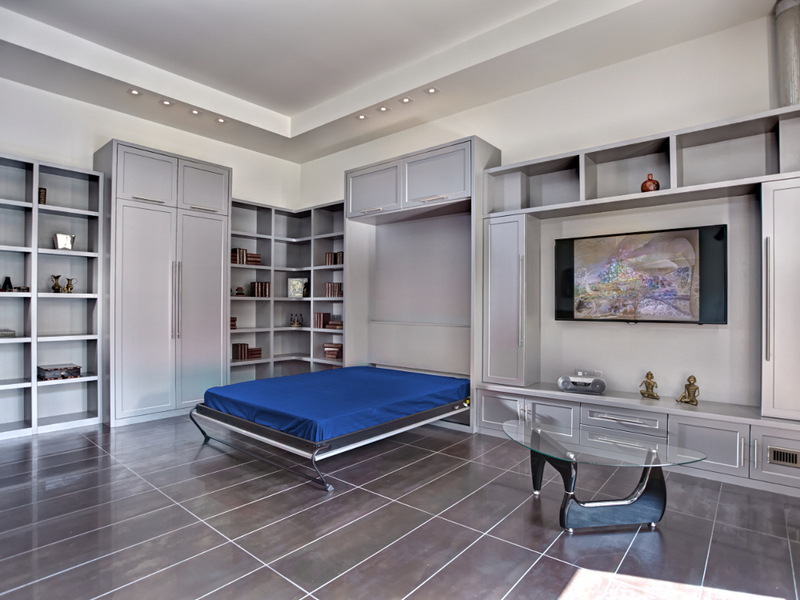 We start with genuine Murphy Bed hardware — the lightweight steel frame provides unmatched reliability and strength, rated to hold up to 2000 lbs. 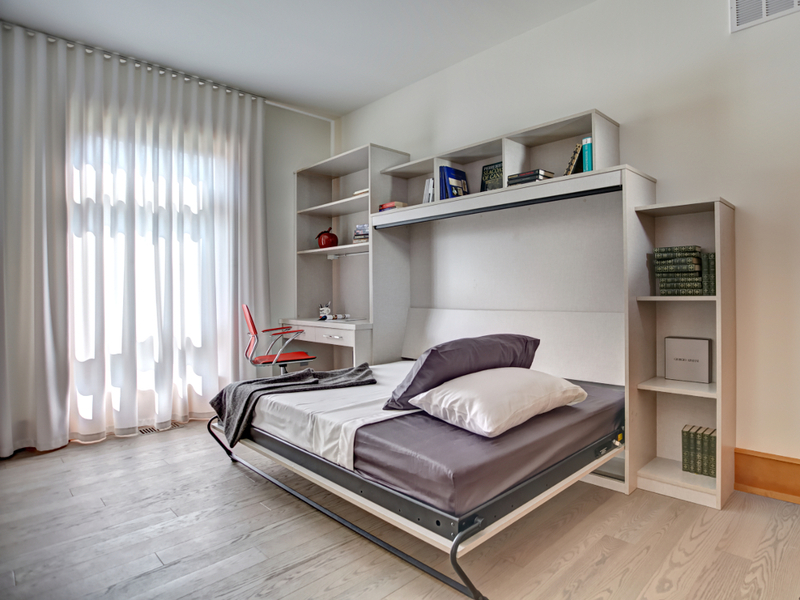 The patented fold over steel leg not only keeps clear when open to prevent stubbing toes, when closed, it rotates in to hold bedding in place. 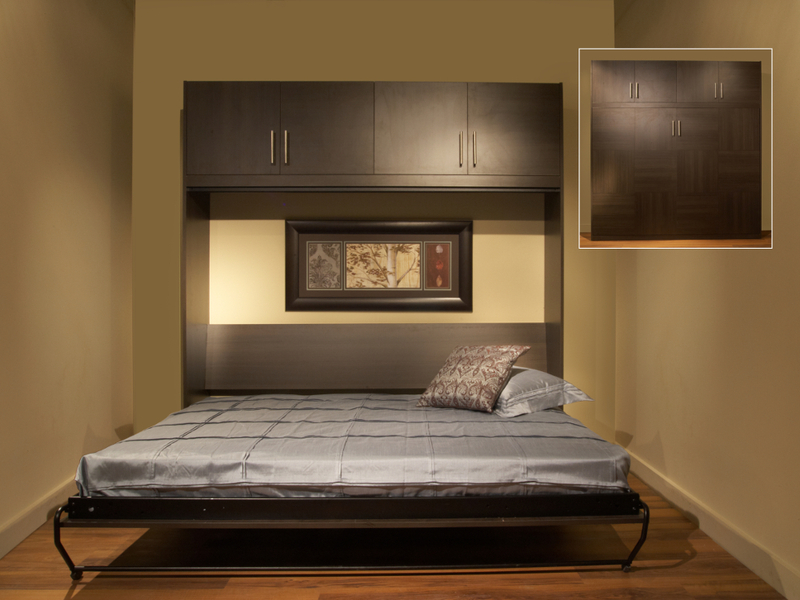 The spring mechanism counterbalances the weight of the mattress to allow gentle “fingertip” raising and lowering. 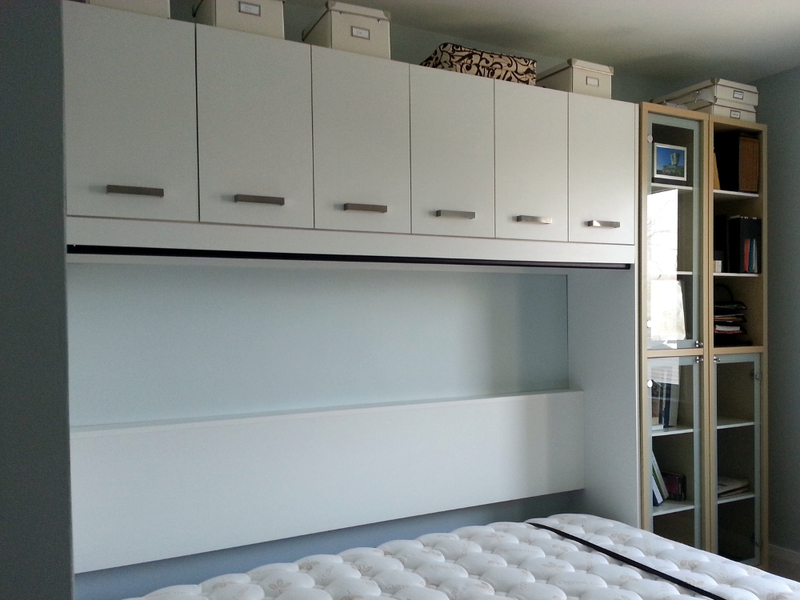 Our trained installers will adjust the springs to ensure smooth, easy operation, and guaranteed installation. 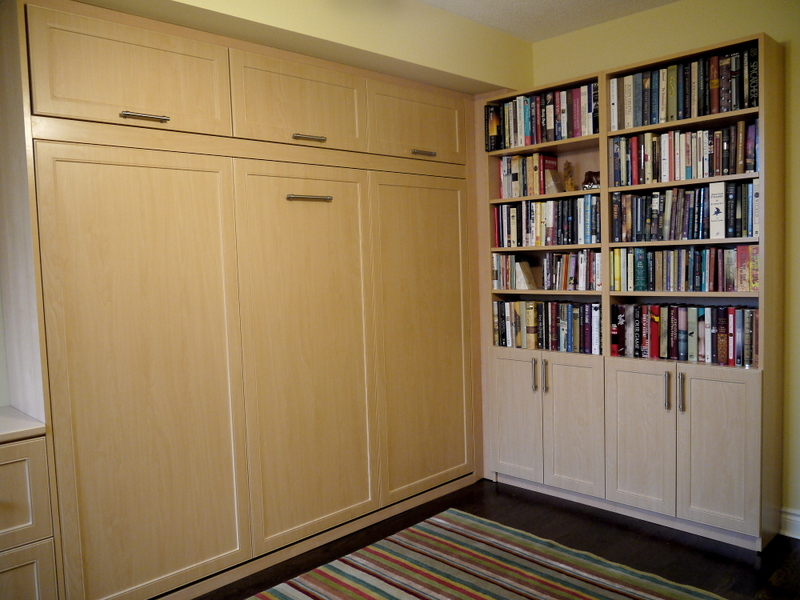 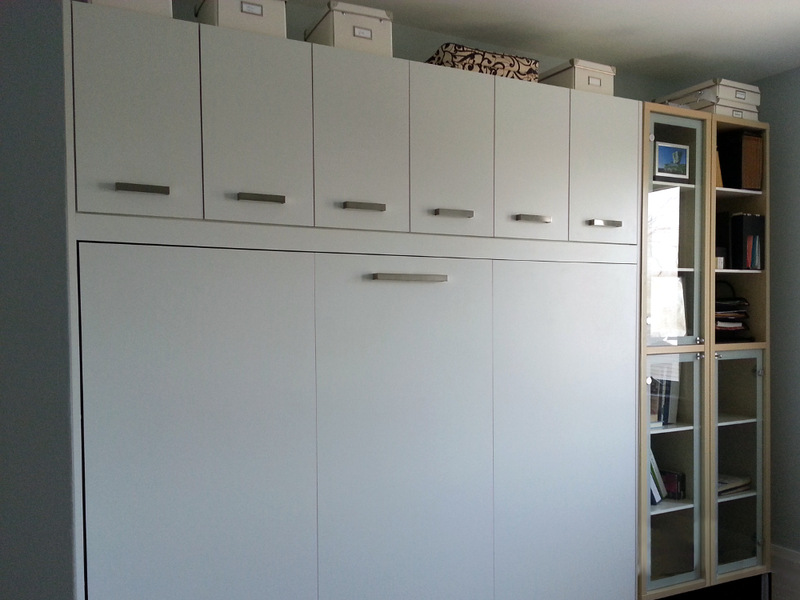 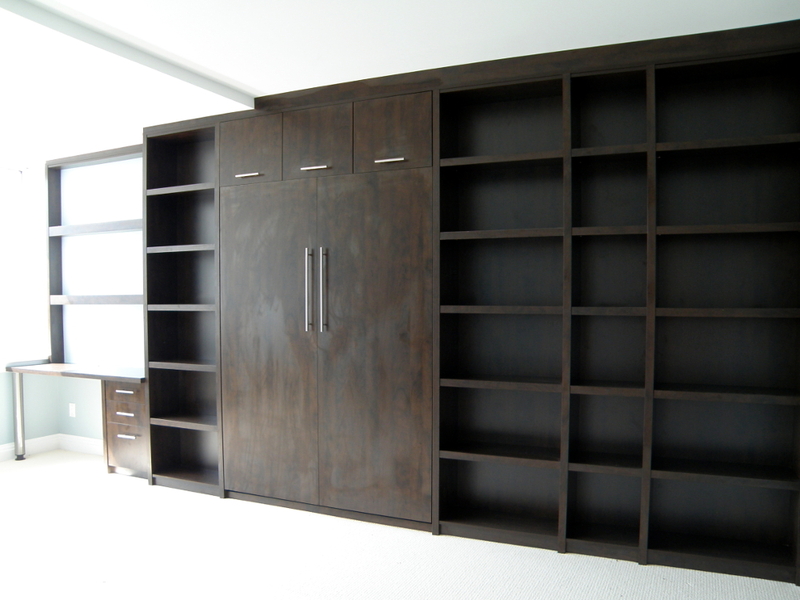 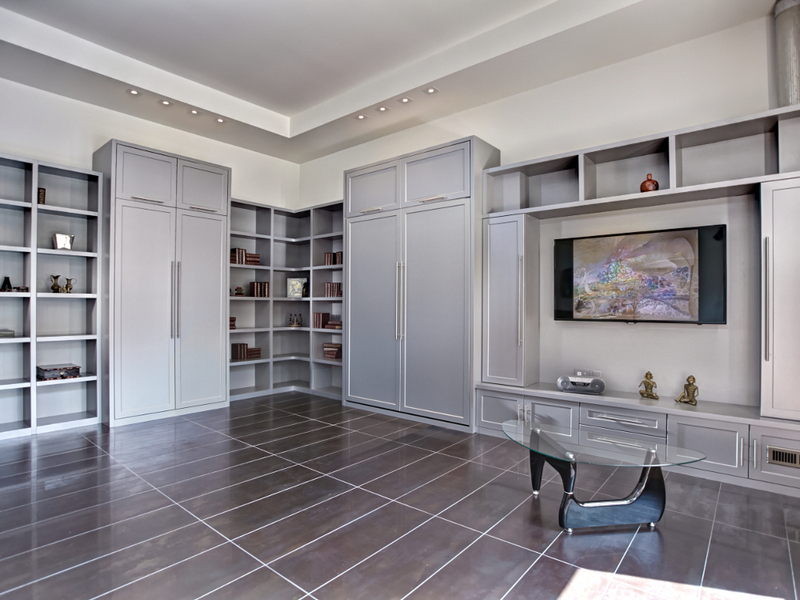 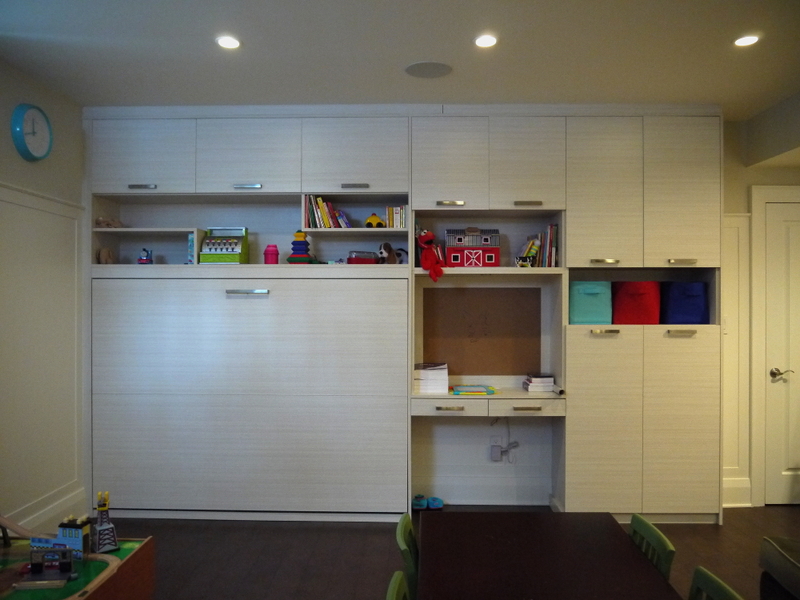 And our solid 3/4″ cabinet construction simply can not be beat. 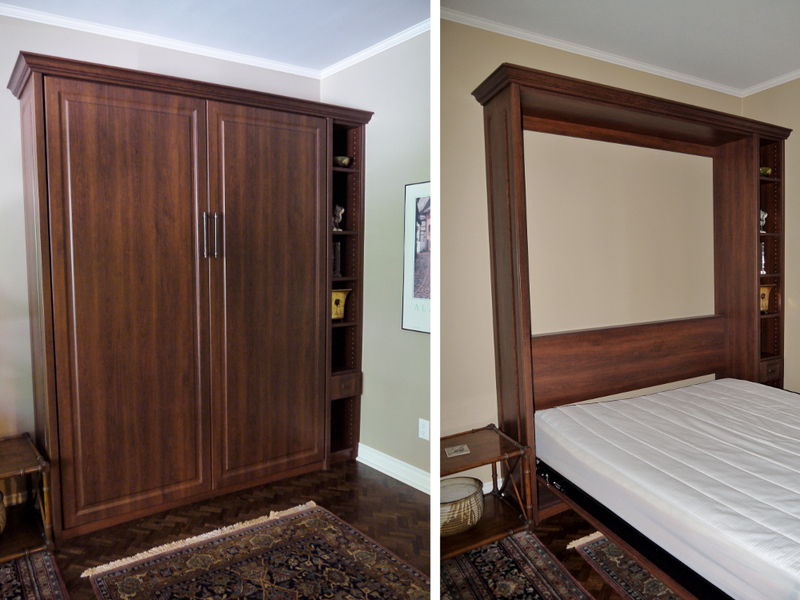 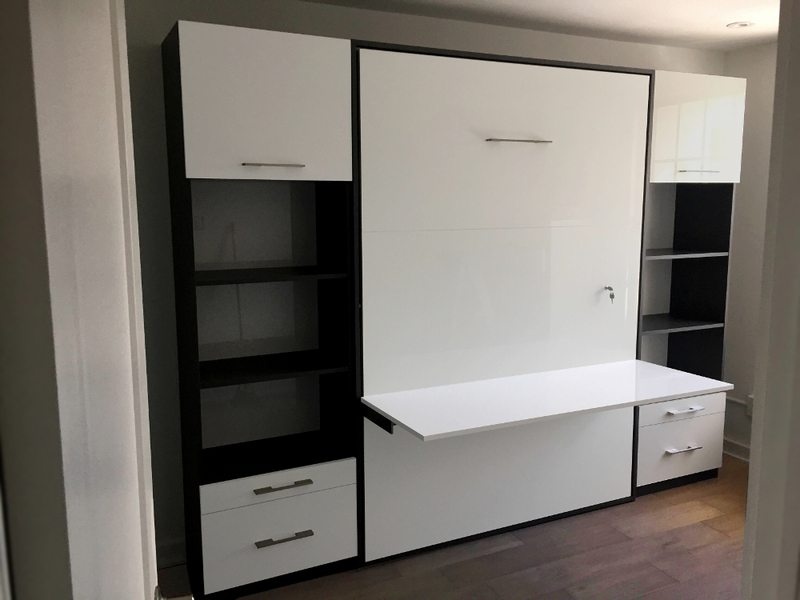 We make Murphy Bed Cabinets to hold a Single, Double or Queen Size mattress, and everything surrounding the bed section — next to, above and even behind the bed area — is completely custom-designed to suit your space and needs. 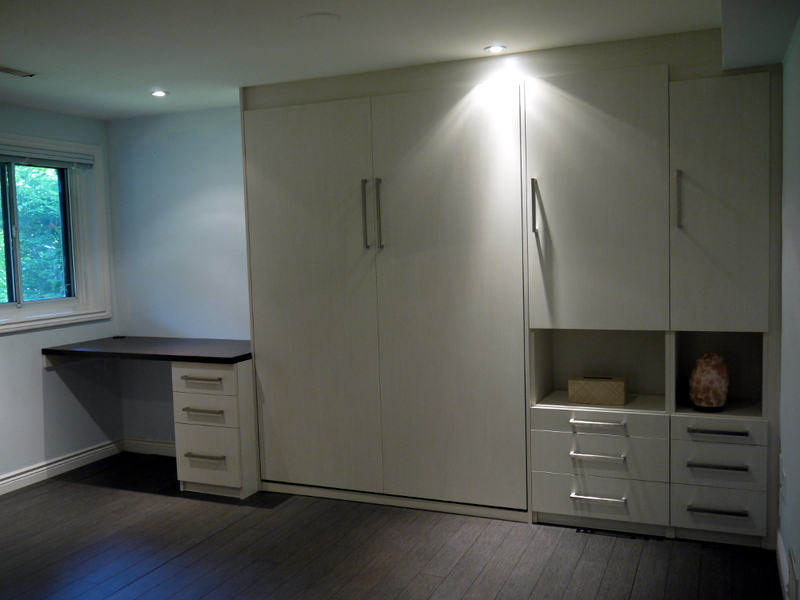 Working with a basement or other height restriction? 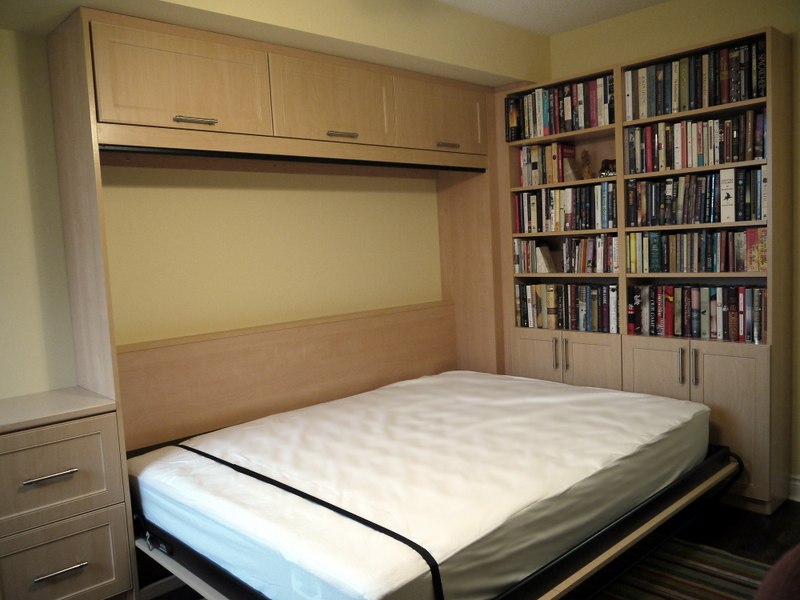 Consider a Side Tilt Murphy Bed, which won’t require as much height, and also won’t protrude as far into the room when open. 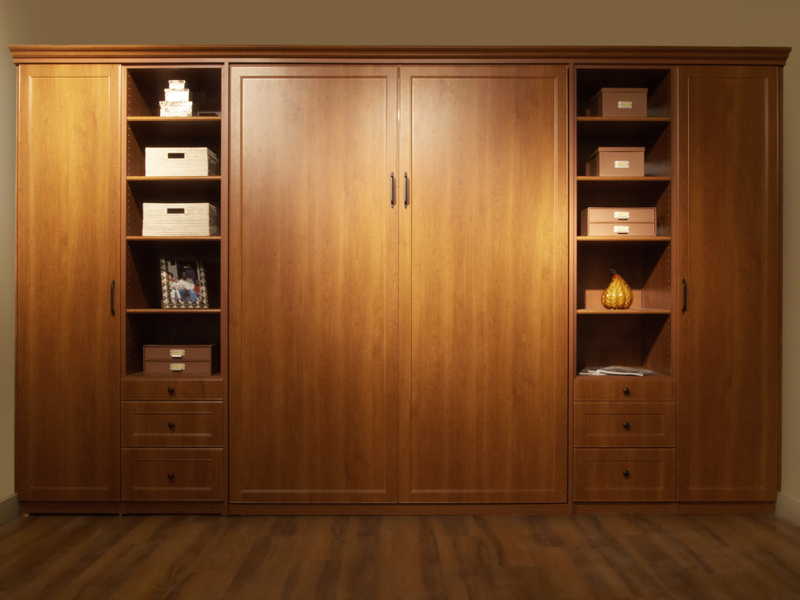 Complete your Murphy Bed with overhead reading lights, a pull-out night-table, interior pillow storage and a tremendous variety of board colors, trims and face profiles, even a work surface on the closed cabinet. 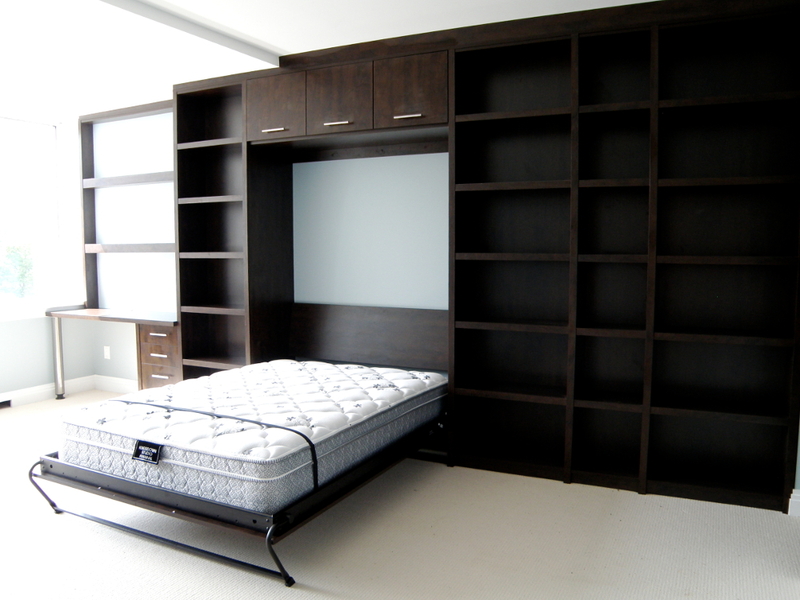 Like all of our projects, our Murphy Beds are custom-designed and fitted for your space and style — add-ons available include profile exteriors, mouldings, endless finish options (including factory painted MDF in the color of your choice) and as usual we will manufacture drawers, shelves, desks and wardrobes to make your Murphy Bed Solution a total Space Solution.